PNC Financial Services Group’s routing numbers for PNC Bank accounts vary from region to region. The PNC routing number depends on the location where the checking account was first opened. The PNC routing number can be found at the bottom left hand side of a check or on a membership card. A PNC Bank routing number always starts with a 0 and it is always 9 digits long. Routing numbers are used to identify a bank or financial institution, and are needed when ordering new checks, and when performing ACH or Wire Transfers within the US. Routing numbers mostly only differs by state and are usually the same for all branches in a state. However, PNC Bank have more than one routing number for Indiana, Ohio, Pennsylvania, Kentucky and Florida. If you opened your account in one of these states, then use the guide at the bottom of this page to find your routing number. These routing numbers are used for specific addresses and branches. How can I find my PNC Bank Account and Routing Number? Your Account number and Bank (ABA) Routing number can be found at the bottom of your checks. The routing number is on the right side, and your account number is the long number in the middle. 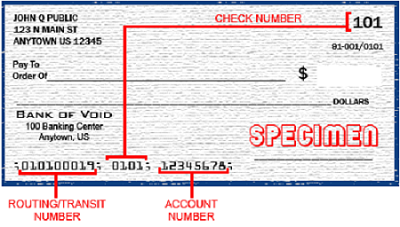 The routing number on a PNC check can be found in the bottom left corner. Use the PNC Routing Number Lookup Tool. PNC Bank also has developed their own ABA number lookup service. You can also contact a PNC Bank Product Client Service Representatives at 1-800-762-9473 (1-800-PNC WIRE), if you need more information about wire transfers. PNC Bank’s Customer Service phone number is 1-888-762-2265 (1-888-PNC-BANK). Visit the Posted Transactions section of the Account Activity page, find a newly posted check and click on the blue link under the Description column. View the check to find the routing and account number. If you have activated Online Statements within Online Banking, you can find your full account number on the PDF version of your Online Statements. On your SmartAccess Card in Online Banking. PNC Incoming International Wire Transfers. Incoming international wire transfer from banks and financial institutions outside of the U.S. will have to use PNC Bank’s SWIFT BIC ID. Please share you experiences, praise or complaints about PNC Bank, in the comment section.